This book doesn’t need many words. Anna Funder has created a punch in the stomach, a work that you could characterise as ‘’Orwellian’’ if it weren’t for the fact that this is reality. It is not fiction, it is a horrible nightmare that lasted too long. That should have never been created in the first place. One of the darkest moments in History told through a series of interviews, mixed with the writer’s personal experiences, centered around the Stasi and its deadly grip on a divided country. To say that Funder’s writing is powerful is a frightful understatement. Her chronicle of the events leading to the fall of the Wall is shuttering, so vivid it makes your heart pound loudly. We think we know all there is to know about the GDR experiment and the Stasi but we may be deceived. We don’t know half of it and it is unthinkable for those who have not experienced oppression and threat in every second of their lives. The tyranny that denies your loved one a proper burial after having murdered him. Obviously. The state where babies are not considered ‘human beings’ (and who is considered as a human being in a totalitarian state, I wonder…) if they are unhealthy. How else could they become ‘useful comrades’’, faithful to the ‘one, true state’, ready to ‘do their duty’? This is the sheer madness of a world that was an endless living nightmare for millions of people who had the misfortune to find themselves in the wrong place at the wrong time. The Eastern Bloc. The confessions of victims and perpetrators are harrowing and raw but Funder doesn’t restrict herself in dry interviews and textbook paragraphs. She creates a background painted in grey colours, a scenery that is strangely beautiful and darkly fascinating in its bleakness. The chapters are rich in beautiful descriptions of Berlin during the night, worthy of the unique, atmospheric capital, a metropolis that has always attracted me since I was old enough to wanderlust and understand. Funder takes us to Alexanderplatz, one of my favourite Berlin spots, and to every corner of the city but she doesn’t stop there. We join her in Potsdam. In Leipzig, the ‘’City of Heroes’’, the city where liberation began, leading to the unification of Germany. I cannot stress enough how much this book touched my soul. I couldn’t let it go, I still can’t and I obsessively discuss it with my mother who’s currently reading it. It is written in a language that may remind you of an exquisite literary work but it is not. It is a chronicle, a memoir of the finest kind. And now, allow me a brief rant because I am done with the stupidity of certain people in the universe. Those who said that Funder didn’t do her research, that she resorted to unfounded generalizations. Have they even paid attention? Or even worse, are they disappointed that their twisted dream of a surveillance state didn’t last? What did they expect, I wonder? A eulogy? A hymn to one of the most horrible human creations? To Communism and Fascism? Because the two are two sides of the same coin. Well, as I always say there is an idiot in every corner, even in Goodreads. Pay no attention to the lovers of a twisted past. They are so miserable their world has ended for good…This is one of the best non-fiction books you’ll ever read on the subject of oppression and pain inflicted by the human race. Not really a rant, more an eloquent heartfelt rebuttal! This is such an eye-opening, gut-wrenching book. 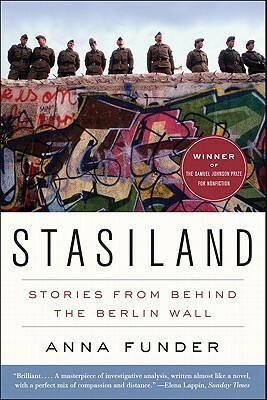 I’ve travelled in the old East Germany a bit more since I first read this. Maybe it’s time for a reread. Thanks for the reminder, Amalia. I love Berlin too. Thank you so much, Susan!! Some of the reviews on Goodreads are truly absurd! I have a passionate love affair with Berlin. I can’t wait to return there in August. Oh, have a wonderful time. Maybe you could blog about it so that I could have a vicarious visit! A powerful book and review, Amalia. I have a piece of the Berlin wall that I will pass onto my family.